History: (Sensational Spider-Man II#33 (fb) ) - The Chameleon hired the Rhino to join the Exterminators. (Sensational Spider-Man II#29) - The Chameleon met Mark Raxton, the Molten Man, at a baseball game where a child Raxton had been mentoring was playing. Chameleon offered Raxton a position in his new super-villain team; when Raxton refused, Chameleon threatened to have Electro kill every player on the field, starting with Raxton's friend. Raxton reluctantly agreed to join the Exterminators. Meanwhile the Scarecrow, another member of the Exterminators, attacked Peter Parker on his way to buy milk. Scarecrow tackled Parker out a window, but the wall-crawler managed to swing the both of them into an empty corporate boardroom. Overcoming Scarecrow's fear-toxins with the help of his new "Iron Spider" suit, he quickly knocked out the undead criminal, only to be confronted by his teammate Will O' the Wisp. Irked by Spider-Man's feigned inability to remember him, Wisp allowed Spider-Man to escape through his own intangible body. (Sensational Spider-Man II#30) - Electro visited the Whitney Museum of Art, unaware that parker had tracked his energy signature there with his new suit. Once Dillon became aware of Parker's presence, he began destroying paintings to draw the hero out. After determining that Electro was lying when he claimed no knowledge of Scarecrow and Wisp's attack on him, Spider-Man used his suit to blast the criminal into unconsciousness with his own siphoned electricity. Meanwhile, at the Soho Playhouse, Swarm attacked Mary Jane and her costars during a Macbeth rehearsal. Brian Sears, a stuntman, hit Swarm with a sandbag, giving Mary Jane time to drop a curtain on him and activate the sprinkler systems. With his bees weighed down by the water, Swarm's animate skeleton lunged at Mary Jane, only to have his skull smashed in with a prop mace by Sears. (Sensational Spider-Man II#31) - As the disguised Chameleon joined May Parker for tea and oatmeal raisin cookies, the Molten Man sprung the trap in Riverdale. As he confronted Spider-Man at the Osborn residence, Scarecrow and Wisp stopped Liz and Normie from escaping. As the battle tore through the house, the Black Cat arrived. Armed with noseplugs to counter Scarecrow's fear-toxins, she made short work of the demonic strawman. Wisp went to help Raxton, but Spider-Man knocked him out of the fight by throwing the Molten Man into him. With his new robotic spider-arms, Parker overwhelmed Raxton, throttling him into submission and extracting the Chameleon's whereabouts from him. Back at Avengers Tower, Aunt May revealed that she knew "Peter" was an imposter, angering the Chameleon. Before he could murder her, as he'd planned, he found himself weakening, as May had laced the oatmeal raisin cookies (which the real Peter hates) with arsenic and Ambien. The poisoned master spy collapsed to the floor. (Sensational Spider-Man II#32/Sensational Spider-Man II#33 (fb) ) - The Rhino, unaware that the Chameleon and the rest of the Exterminators had been defeated, ambushed Spider-Man and brutally beat him. (Sensational Spider-Man II#33) - The Rhino sought the Chameleon out at his Jungle Club, but found it abandoned and learned of the Exterminators' fate. He regretted that the Chameleon hadn't paid him in advance. Comments: Created by Roberto Aguirre-Sacasa, Angel Medina, & Scott Hanna. 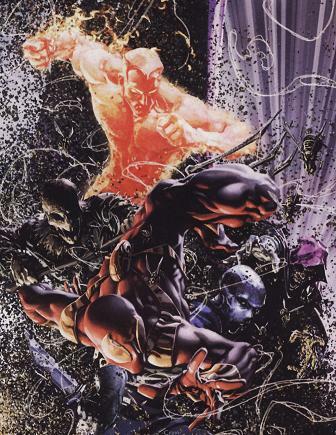 After their capture, SHIELD used Molten Man and Scarecrow as bait for Captain America's Secret Avengers, but they just ended up getting roughed up by the Punisher. Poisoned by Aunt May. Jeez. That's even more embarrassing than being beaten up by a bat-wielding Mary Jane. There is no image of the complete group, sadly. That Clayton Crain cover sure is pretty, though. I guess Electro and Chameleon know each other from serving in the Gentleman's Sinister Six and the Sinister Twelve, but this is a pretty random collection of guys otherwise. Molten Man was blackmailed into serving, and the Spider-Man Back in Black Handbook speculates that Will O' the Wisp was, too. Scarecrow has only fought with Spider-Man twice, but he probably doesn't need much of an excuse to create mayhem, being a demon zombie and all. As for Swarm...well, it's possible that his hatred for Spider-Man overrode his hatred for all vertebrate life.